Being at the Capitol can be a family affair, literally! Barry Boughton volunteers each Monday at the U.S. Capitol Visitor Center (CVC). Originally from Michigan, Barry was an attorney who moved to Washington, D.C. in 2001. A CVC volunteer since 2011, Barry also volunteers at the Library of Congress. "One of the many pleasures of being a volunteer at the Capitol," he says "is that I'm in the company of my ancestors." Barry’s son Andrew and his four kids, Timothy, Ariana, Nicholas and Matthew, in front of their great grandfather William Brewster, twelve generations removed. Boughton's tenth great grandfather, Elder William Brewster was a Pilgrim Leader and preacher on the Mayflower. Brewster appears at the center of Robert Weir's 1844 mural "The Embarkation of the Pilgrims" in the Rotunda. From Scrooby, in North Nottinghamshire, England, Elder Brewster reached what became the Plymouth Colony in 1620. He was accompanied on the voyage by his wife, Mary Brewster, and his sons, Love Brewster and Wrestling Brewster. In the mural, Brewster holds the Bible. The woman and child at the left may be his wife Mary and son Love. Brewster was hiding in England with a price on his head when he secretly joined his wife on the Mayflower at Southampton. Brewster had attended Cambridge University where he received some legal training, and, as a result, it is believed that he contributed to the writing of the Mayflower Compact. Weir's painting was hung on the bicentennial of Elder Brewster's death. Barry with his sixth great uncle, Johnathan Trumbull of Connecticut. A second piece of Capitol art has a Boughton familial connection. 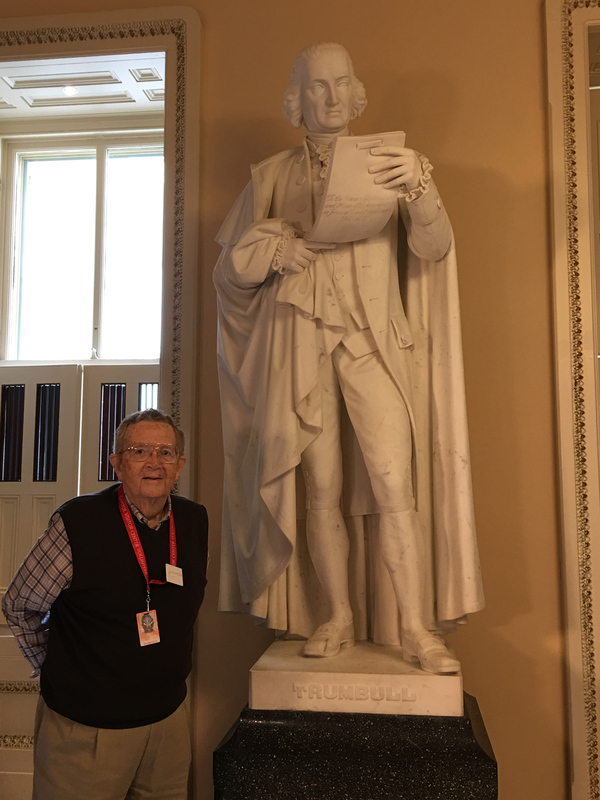 On the second floor of the Capitol between the Rotunda and the House Chamber stands the statute of Jonathan Trumbull of Connecticut, Boughton's sixth great uncle. Trumbull's sister, Mary, is Boughton's fifth great grandmother. Jonathan graduated from Harvard University and was elected to the Colonial Assembly where he argued that the Stamp Act was unconstitutional. In 1769 he became Royal Governor of the colony. Jonathan Trumbull was the only Colonial Governor to support the Revolution. A friend of George Washington, he supported the recruitment of soldiers and the acquisition of supplies. His son, also named Jonathan, was confidential secretary to General Washington, second Speaker of the U.S. House of Representatives, and also served as governor of Connecticut. Even more astounding is the fact that in 1817, the House of Representatives commissioned Jonathan's son, John Trumbull to paint four paintings for the Rotunda. John Trumbull was Boughton's first cousin six generations removed. The paintings were installed in 1826 and represent the crowning achievement of Trumbull's artistic career. His painting, "The Declaration of Independence" is on the reverse of the two-dollar bill. Trumbull's portrait of the first Secretary of the Treasury, Alexander Hamilton, graces the ten-dollar bill. 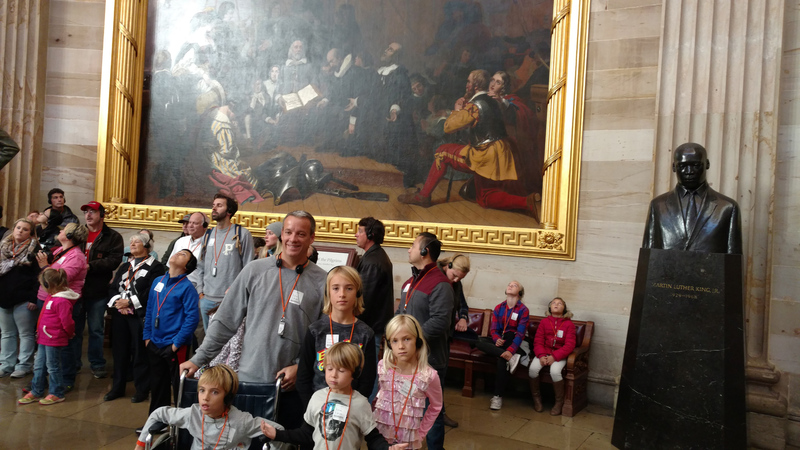 A tour of the Capitol is much like walking among the greats. For Boughton, it's all relative. Wayne Kehoe is a Volunteer Services Specialist at the Capitol Visitor Center. How nice to connect past and present. Barry must have lots of "Yankee" roots. Thank you for an interesting read. What a great personal connection. Thank you for writing and sharing this Wayne. Keep up the great work.